The Italians have devised a special role for the garlic bulb, a member of the allium family which also counts among its ranks the onion and the leek. While a great many Mediterranean recipes seem to take the presence of garlic as a given, this is not always the case in the Italian peninsula for the simple reason that its distinctive taste can sometimes detract from more shy and retiring ingredients. Similarly, whereas the more ballsy Neapolitans may throw it in without a thought, some of their more reserved Northern compatriots would hold back. How Much Garlic to Use? If garlic is to be included, then there is the question of how much. For example, a piece of roast pork or a whole roast chicken could be accompanied in the oven by one, even two whole bulbs. An hour or two in the intense heat will effectively pulp the flesh but bestow on it a relatively subtle taste and aroma. It would then simply be a case of squeezing out the cooked garlic and adding it to the meat juices for a delicious sauce. When adding garlic to the soffritto for a pasta sauce, only one clove is usually required, given that its close relative, the onion, will already be contributing to the influence of the alliums. 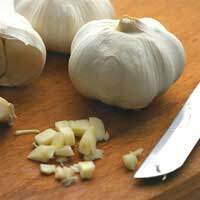 The simplest method for peeling a garlic clove is to give it a gentle strike with the flat of a knife. This will split the very dry skin which should fall away from the flesh with ease. If, however, even this simple operation is rather too labour intensive, then pop the clove, or cloves, on a plate and microwave for 10 seconds (no longer, you don't want the garlic to begin cooking). Once the skin has been removed, either finely slice the clove with a very sharp knife, place it on the cutting board and chop into tiny dice by placing the free hand on top of the knife blade and the other to rock the handle up and down against the board, or pulp by chopping, adding a little ground salt, and crushing with the flat of the knife blade against the cutting surface. When sautéing, ensure that the butter and/or oil is sufficiently hot in order that the garlic begins cooking as soon as it hits the pan. It should then be allowed to sizzle for around 30 seconds before the cooking liquor is added. At all costs, avoid overcooking because as the garlic browns it begins to exude a bitter aroma that will be a portent of its contribution to the final flavour of the dish. Medieval superstition had it that garlic was a potent weapon in fighting off the unwanted attentions of the local vampire. Overcooking it will ensure that mere mortals will think twice before darkening your kitchen door too.